Mazda Motor Corporation, in collaboration with Sumitomo Metal Industries, Ltd. and Aisin Takaoka Co., Ltd., has become the first automaker to successfully develop vehicle components using 1,800 MPa ultra-high tensile steel. The super strength steel will debut in the all-new Mazda CX-5 crossover SUV that will commence its global launch in early 2012. 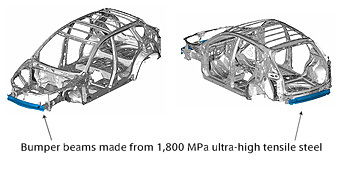 Mazda's new production technology uses 1,800 MPa ultra-high tensile steel to fabricate bumper beams, which fit inside the front and rear bumpers and mitigate damage in the event of a collision. The bumper bars are 20 percent stronger and 4.8 kilograms lighter than previous versions and are a key part of Mazda's next-generation, lightweight and highly rigid vehicle architecture. The new body architecture was developed as part of Mazda's breakthrough SKYACTIV TECHNOLOGY program and incorporates a new energy absorbing structure as well as an expanded use of high tensile steel to reduce weight. The use of high tensile steel enables vehicle parts to be thinner yet still retain the same degree of strength. This leads to significant savings in vehicle weight. Reducing the weight of bumper beams is particularly important because, as they are incorporated into the body structure at the farthest point from the vehicle's centre of gravity, their weight has a considerable effect on dynamic performance and responsiveness. They must also be strong to provide sufficient collision protection. For these reasons, a method of mass producing the parts using stronger steel has been highly sought after. FS: New B-series Competition Clutch 9 lb steel "Ultra Lightweight" flywheel.